Dr Maria Flachsbarth has a degree in veterinary medicine. 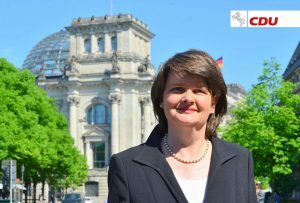 Since March 2018, she has been the Parliamentary State Secretary to the Federal Minister for Economic Cooperation and Development (BMZ). Establishing ‘clarity about the green button’ is an important goal for Dr Maria Flachsbarth. Since March, she has been the Parliamentary State Secretary at BMZ; the Textile Partnership is one of her remits. Dr Flachsbarth travelled to Berlin to attend the 19th meeting of the Steering Committee, and one of her objectives was to deliver a statement about the planned government meta-label. By creating the green button, the Ministry intends to create a recognisable and clearly identifiable label for consumers and consequently boost the demand for sustainably produced textiles, she said. In turn, suppliers who fail to provide evidence of sustainable business practice will be put under pressure to change. ‘The green button is coming’, Minister Müller concurred at the Steering Committee meeting, ‘and I expressly invite you to play an active part in fleshing it out’. In order for a product to get a green button, reliable seals must be used to prove that the German Government’s minimum requirements are met in both environmental and social terms. The basis for this assessment is the ‘seal clarity’ portal, Dr Flachsbarth explained. ‘Our actual goal is fully sustainable textiles – from cotton field to coat hanger. But we are also well aware that this expectation cannot be met at the moment’. That’s why in the first phase, the focus is only on textile production, and more specifically, on garment assembly. The requirements for obtaining the green button will gradually increase and step by step, will include additional levels of the supply chain. In addition to the requirements specified for the products themselves, the Ministry is calling for companies to provide evidence that they comply with corporate due diligence. Textile Partnership members have an advantage in this respect, because by fulfilling the requirements of the Review Process, they meet this prerequisite for access. In addition, plans call for other verification options to be available. The differing approaches of the Textile Partnership and the green button were also discussed. Dr Flachsbarth clearly stated that these are two complementary approaches without any binding connection. While the Textile Partnership works systemically to implement corporate due diligence, the green button is a meta-seal on the product whose purpose is to provide guidance for consumers when shopping. The Steering Committee highlighted this difference by adopting the wording for communicating about the relationship between the green button and the Textile Partnership: ‘Despite the identical objective of achieving social, ecological and economic improvements along the entire textile supply chain, there is no direct connection between the Textile Partnership and the proposed green button. This is due primarily to the different frameworks and systemic approaches of the two initiatives’. We would like to welcome the Berlin-based children’s clothing manufacturer CharLe as a new member of the Textile Partnership. The company is run by a small team of family members, young fashion designers and close partners committed to producing timeless children’s fashion using natural textiles. CharLe works only with environmentally sound and fairly produced natural fibres that comply with the Global Organic Textile Standard (GOTS).